Luke cobbled his letter together with pen and ink, torn notepads and scotch tape. Very Luke. 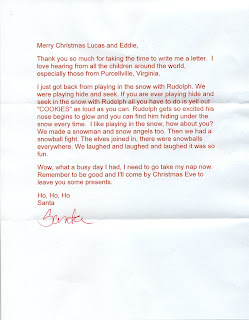 Eddie is learning to use Word Perfect on his computer, and wrote this letter all on his own, fonts and all. He had the idea for the Santa picture in the background; I only showed him how to do it. Is this part of your war on Christmas? Probably low fat muffins that are good for you too. Probably think the jolly old fat man needs to drop a few or something. It's cookies! Santa demands cookies! That's Eddie for you... always wants to be a little bit different. Frankly, Santa could afford to do a couple ab-crunches before he departs for Christmas! 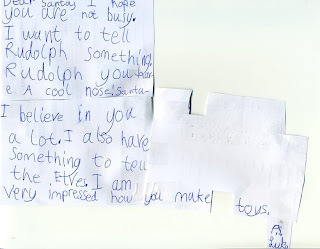 Those are quite some letters that the boys wrote to Santa. Luke's looks like something Mike would have done at that age. 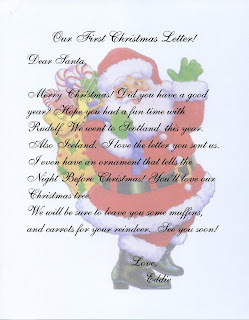 Eddie's letter was quite impressive. He really did a nice job. Maybe he can teach Nana a few tricks.